In recognition of the need for a focused effort at promoting the mission of the organization, the VFP Board of Directors proposed a National Strategy Plan in August 2012. However, in my opinion, it was so unfocused that it defeated the very purpose it was created to accomplish. More importantly, I claim that the existing action strategy is severely deficient. Here, I first briefly examine the current action strategy, emphasize its deficiency and offer a way to correct it. Before proceeding I would like to fix a few terms: a mission is the grand goal for which an organization is created; an action strategy is a plan for achieving a mission while tactics are the specific activities carried out by members enabling the strategy. – Exposing the public to the true costs of war and the real motives as to why the Executive branch engages in wars. This is intended to undermine public support for wars in favor of nonviolent means of conflict resolution. – Emphasizing to the public the overblown size of “national defense” spending in comparison to the rest of the national priorities. This is intended to galvanize the public to demand a reduction in military funding, thus taming US military capability and limiting the Executive branch’s ability to conduct large scale military offensives abroad. – Building a culture of peace on an individual level. This is intended to alter how we think about dealing with international conflicts and ultimately produce a more sensible foreign policy. This strategy was in place for many years; however, the US Empire remains and the waging of war by our federal government continues, indicating that the strategy is not working well. I claim that the whole strategy is defective because it assumes that the informed public will be able to effectively influence their Congress members or otherwise elect pro-peace candidates needed to keep in check the war-mongering tendencies of the Executive branch. Someone may claim that members of Congress genuinely represent the public’s views on matters of foreign policy/national security since the public often supports the Executive branch’s decisions for starting wars. The problem with this argument is that when a few years later public opinion swings against a war, Congress does not rush to act to end it. More importantly, members of Congress are elected to represent public interests not the majority opinion. The waning of support for wars over time as war costs begin manifesting while the facts start cracking the facade of propaganda indicates that true public interest does not align with waging occupational wars. However, this realization always comes too late because the manifestations of war costs are always delayed. Here is where a genuinely public representative must rise and present to the constituency the ramifications for a nation to engage in a war proposed by the Executive branch. Congresspersons are sufficiently familiar with US history to remember that wars lead to displaced federal priorities, economic costs, lots of bloodshed, hatred from people of the occupied nations, and ultimately blowback. Congress members vote annually on the federal budget and know that most of the discretionary funds are spent funding militarism and the maintenance of the Empire at the expense of domestic priorities. Members on Foreign Intelligence Committees have access to intelligence reports to study evidence or lack thereof about potential threats to our national security and ask difficult questions of members of the Administration or to subpoena them if necessary. Moreover, they have the power to authorize (Article I, Section 8) and (de)fund wars. The War Powers Resolution Act of 1973 explicitly spells out the terms for the separation of war powers with Congress having an upper hand. Despite significant powers most members of Congress comply with the judgment of the Executive’s branch on matters of war (while some actively push for wars) against public interest. Why? The majority of congresspersons do not represent the interests of the general public because the general public plays a minor role in electing them to power in the first place as detailed below. The above data shows that small individual contributions (less than $200) rarely exceed 5-8% of the total campaign funds, whereas the rest of the funds come from large campaign donors (corporate PACs and wealthy individuals). Therefore members of Congress are easily accessible and attuned toward the demands of major campaign donors and fundraiser organizers (commonly lobbyists). No incumbent member of Congress or candidate wants to upset major campaign donors who thereby implicitly set the political climate and the federal policy. This is very problematic because the interests of the economic elites and the ordinary public are commonly in conflict. Such a contradiction of interests is vivid on the issue of war. Ordinary Americans overwhelmingly pay human and economic costs at the time of wars whereas executives of “defense” companies and their lobbyists reap huge rewards from government contracts. As war ends, ordinary Americans continue paying economic costs due to displaced government priorities whereas executives of transnational corporations and banks receive favorable access to new markets falling under the control of the American Empire. The described contradiction of interests when multiplied by the differences in the ability to influence Congress (roughly measured by the amount of campaign donations) creates a gross misrepresentation of public interest in Washington D.C. and therefore is a form of government corruption. So, even though the ordinary public constitutes the majority of voters and technically elects candidates to Congress, large campaign donors effectively decide which candidate will be able to sustain the political campaign to end up on the voting ballot. To that extent, the assumption that “the informed public will be able to effectively influence their Congress members or otherwise elect pro-peace candidates …” is flawed because public demands are not matched by campaign contributions vital for the Congressperson’s re-election campaign. Existing misrepresentation in Congress indicates that repairing the current action strategy requires putting ordinary people at the center of the congresspersons’ attention. Moreover, since waging occupational wars contradicts the interests of ordinary people, a genuine representation of those interests in Congress, not corrupted by the influence of large campaign donations, may actually be sufficient to guide the peace-oriented foreign policy. Therefore, an effective action strategy should include a campaign toward putting ordinary people at the center of the congresspersons’ attention. There is a reason public approval of Congress consistently polls around 15%. The majority of Americans understand that our Republic is severely ill, but the cause of the illness is far less obvious. Therefore many advocacy groups attempt to treat the symptoms of the illness manifested in unending wars, a militarized budget, income inequality, an absence of accessible health care and higher education, etc. My thesis is that the root cause common to all of the above (and many other) ills is the undue influence of big money in politics and must be addressed by enacting campaign finance reform for congressional elections. 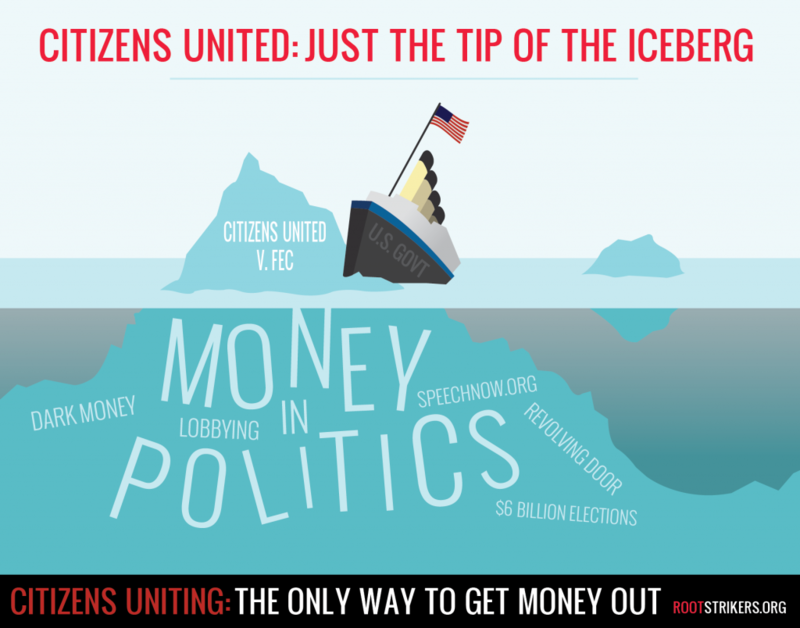 The infamous Supreme Court ruling in 2010 on Citizens United vs. FEC invigorated the public on the broader issue of the influence of big money on our elected officials. Now, the majority of voters across party lines support some form of campaign finance reform. In my opinion, VFP and other peace groups must not only welcome but actively advocate for campaign finance reform in order to create an effective action strategy. Some believe that only a constitutional amendment declaring that “corporations are not people” and that “money is not a protected speech and can be regulated” is the only way to address the problem. Since constitutional amendments are hard to obtain, a meaningful reform may seem out of reach. However, it appears that substantial reform may be achieved without a constitutional amendment. As of 2013 there are several legislative proposals which would help reduce the influence of big money and increase the influence of ordinary voters on the decision making process in Washington D.C. Undoubtedly, most of them will fail or if enacted would not solve the entire problem. Nevertheless, they are the elements which shift the influence on Congress from the affluent minority with special interests towards the general public in order to create a more perfect union. Until then all we have is the hope that our Presidents will choose to not over-abuse their war power. Great Article, Sergey! To be successful as an organization, we need to focus on “root cause(s)” of the problem. Your thesis is the bought off congress does not accurately represent The People, and I agree. The important point is that our VFP National Strategy Plan does NOT focus on a root cause that prevents us from accomplishing our organization’s goals. I had the same feeling/surprise when I read the Plan. Thanks for taking the time to identify and elaborate on a Root Cause – whether folks agree as to it being “principal cause”, it is definitely an effort that could focus our work. And why I have bumper stickers to that effect…. I agree with your premise. I think back to all the times I visited our congress people and how many of them consistently avoided seeing us until we threatened them. Bottom line we got very little for all our efforts. They know how to play the game and the little guy never gets to bat and never really gets into the game for the reasons that you point out. War,poverty, poor treatment of returning soldiers and overall bankruptcy of our country are all symptoms of the root cause and that is campaign financing. We should be demanding our congress people to aggressively support campaign finance reform.What is in it for them? they will free up four hours per day begging for money and instead do the job we pay them to do which is to truly represent the people and the country’s concerns.